The Dark Knight Returns, the two-part, animated feature film adaptation of Frank Miller's seminal Batman story that's been cited as influencing the Tim Burton and Christopher Nolan Batman film franchises, has finally revealed its first full trailer ahead of the first movie's October release. The ad appears to be--or perhaps this is just incidental--playing up the plot similarities between The Dark Knight Returns and The Dark Knight Rises, the $500 million-and-counting blockbuster film that hit theaters earlier this month. 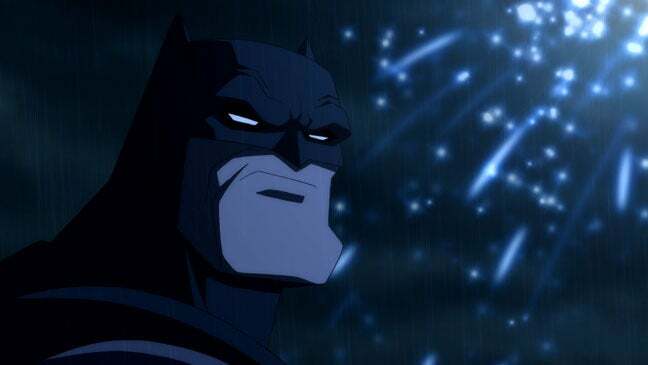 Featuring the revelation that Batman has been out of circulation for years, followed by images of a musclebound titan terrorizing the city, it seems likely casual viewers will intuit a connection between the two films, which probably can't hurt The Dark Knight Returns, Part One, which Warner would obviously like to see succeed considering they're committed to a Part Two. The film stars Peter Weller (RoboCop, Psych) as Batman, along with Ariel Winter (Kiss Kiss Bang Bang, Modern Family) as Carrie Kelley/Robin and an all-star voice cast including Robert Paulsen, Maurice LaMarche and more. The Dark Knight Returns, Part One will be released on October 23, 2012, followed by its sequel in early 2013.